Hi, guys, this is Arca. For the past 5 days, I was in Vermont on a ski trip in Stratton. I was still able to make two posts while I was there. Those were the Star Wars: Rogue One movie review and also the Happy Holidays post. 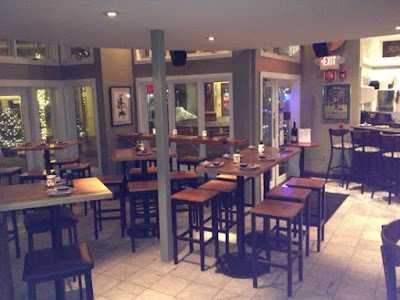 This post will be a review of the place and a summary of what we did there. Above: An animated GIF I created of a video of Onur skiing downhill. This review will be broken into five parts: trails, lifts, dining/food, shopping, and hotels/condos. I will give each of these parts of the resort a rating out of 5 stars. I will average these ratings and give an overall rating of Stratton at the end. The trails were pretty fun! Since in ski school, my level is silver (it's the second best level, the best is black) I went on mostly blues and blacks. 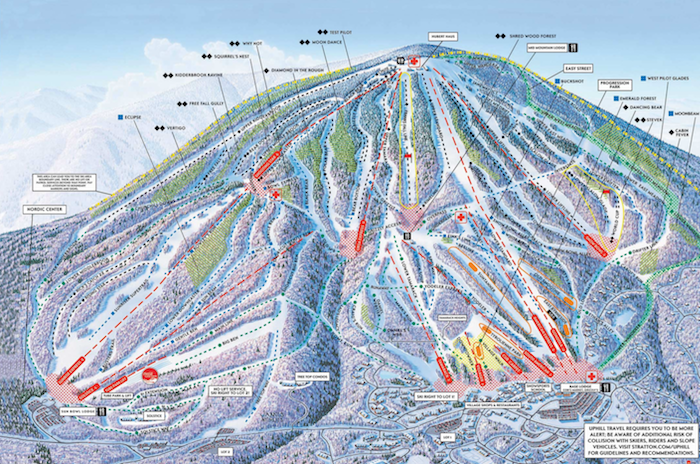 The easiest trails are blue circles, intermediate ones are blue squares, hard ones are black diamonds, and experts only are double-black diamonds. Some of them were kinda icy and hard to navigate, but the snow was mostly smooth. My favorite trails were East Meadow (green), Spillway (blue), and Black Bear (blue that is almost a black because of the end of the trail being very steep). So I rate the trails 4.9 out of 5 stars, because of the ice. There were three types of lifts: carpets, chair lifts, and the gondola. There were three carpets, all of which were basically like conveyor belts. Two were very small and were meant for little kids who wanted to go up a small hill near the bottom. There was a larger one that was also a moving carpet and it was called the caterpillar. It took up to the top of a larger hill, but it wasn't that big or steep either. The smaller ones were faster than the caterpillar. I have fallen off the caterpillar once since it isn't the most stable thing out there. 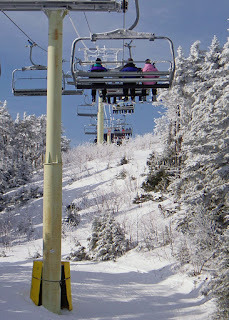 There were several chair lifts. They were chairs that lifted up on a wire. They either took you halfway up the mountain from the bottom or to the top from the middle. The one I went on the most frequently was called the American Express. It was a chair lift that took you halfway up Stratton mountain. It traveled at 15 miles per hour and was a bit shaky at the start. It had a restraint bar that you could lower but it didn't really stop you from falling. The gap was big enough so that you could literally jump out if you tried. But the lift was decent. There was one called South American, and it was NEVER open. 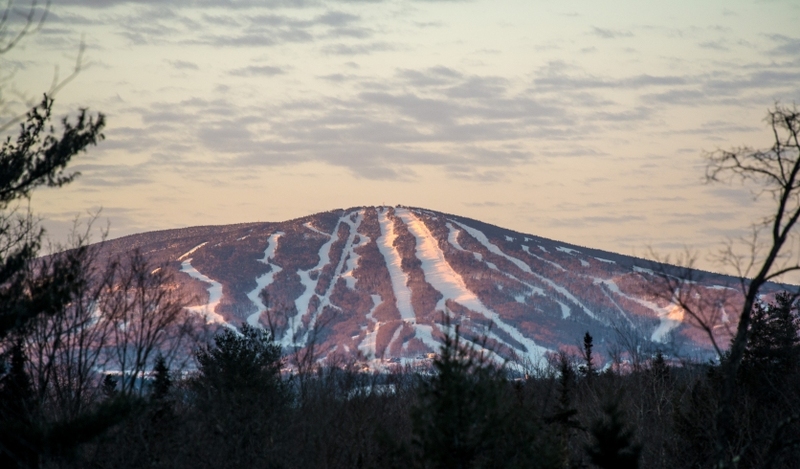 According to one of my ski instructors, he has only seen it open three times in his 15 years at Stratton. There was 0only one Gondola, and it took you all the way to the top from the bottom. These were closed cabins on a wire, with a place to put off your skis once you take them off. It was more comfortable than to leave them dangling, as you did on the chair lift. It was also warmer. It got shaky when the wind was a lot at the top. I rate the lifts 4.8 out of 5 stars. They had many restaurants there. The ones that we went to were a sushi place, a tavern, a general cafeteria, a breakfast buffet, and a hotel dinner place. The tavern had good burgers and it didn't take that long to get your food. The sushi place had great rolls and lobsters. The cafeteria was WAY overpriced. A burger cost 18 dollars! Think that's too much for just one burger? The candy bars were 3 dollars each! The breakfast buffet didn't really have that many options, but it was okay. The hotel dinner place was my least favorite place. The food was actually very good, but it took more than an hour for our food to be delivered! However, they did give out free bags of gummy bears. They also had a waffle stand with delicious Belgian waffles. I rate the dining/food 4.6 out of 5 stars. They had many shops in the central village area. We went to a helmet shop called Head Case. They had some super expensive helmets. But we were able to get them on discount. Plus, my parents got me my own GoProm camera for getting into honors math! (More on that later on in this post.) But it seemed that they were taking advantage of tourists. Accessories for the GoPro cost 20-30 dollars each, but you can get a bundle of 5 of them on Amazon for only 20 dollars. The GoPro requires a MicroSD card to work and handle data. They are sold separately. Here they sold it for 70 dollars, but it is on Amazon for 12 dollars. I rate the shopping 4.7 out of 5 stars. We at first stayed in a hotel roomed, but then realized it was way too small to stay in. So we moved to a condo called Long Trail. The room there was a lot bigger. The condos are great overall, but not so much for the hotels. I rate the hotels/condos 4.8 out of 5 stars. I did the math and averaged out the reviews for each section and found out that the overall review is therefore 4.76 out of 5 stars. 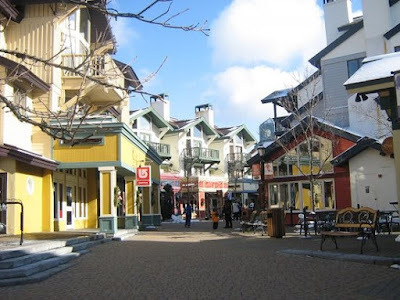 This is a good resort for families to stay together in, and skiers/snowboarders of all ages and ability levels will enjoy the mountain. As I mentioned earlier in this post, I got a GoPro Hero Plus while I was there! It is waterproof, has adhesive mounts to stick to stuff, can do videos and photos and also time lapses, and has a high-quality resolution of 1080p. Using the GoPro app, you can edit, view, and share your videos. I plan to use this for YouTube vlogs to places such as SixFlags and Cancun, Mexico which I will go to during spring break of this year. I hope you enjoyed this post. Share it with others if you liked it. Happy Holidays to all! See you next time! BBBYYYYYEEEEEEE!!!! !